I got into this via my interest in digital radio. Computers are now fast enough to do the processing required to demodulate radio intermediate frequency in real time. You can therefore have a very simple bit of hardware radio frequency down conversion that feeds into the audio port of your computer and the rest is done in software. SDR gives you an incredibly full featured radio, with more dials and displays (all virtual), than you could want. I've been aware of GNURadio for some time, but it's pretty hard to get started with. There is even software for the Mac from the incredibly friendly Kok Chen (with source!). I notice that hamlib builds just fine on the mac and the command line tools work. This means you can control many "hard" receivers via a serial port (works with USB adapters). So far I haven't found a nice cocoa client that uses hamlib so I'm working on one myself. I paid rather too much money for the nifty DRT1 from Sat-Schnider and have spent the weekend playing with software and mounting it in an external box. This thing is controlled by commands over a serial port (it has no display at all - I've added a power LED). It converts a slab of radio down to audio which you feed into your computer for demodulation. 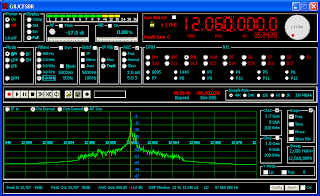 There are several software radios around, the one shown above is from Peter Carnegie, but there's also the Dream software for DRM decoding. Seems to me that this kind of thing might be built at very low cost using an NE602 balanced mixer and synthesized oscillator controlled by a PIC microprocessor or something. I heard today on the WIA Sunday broadcast that the BBC is to begin trials of DRM (Digital Radio Modiale) on medium wave. Perhaps radio is set for another revolution, AM -> FM -> DRM. This is Peter Carnegie, ex G9JCF, thank you for commenting on my G8JCFSDR, you should try Build 198 which adds many new features, espec for IQ down-converters. The new Elektor IQ SDR h/w works really well and is very cost-effective.